This Good Friday 30th March the CPR Challenge will be pumping the life through the heart of Melbourne! Located at the MCEC with the Kids Day out, you can find us upstairs on level 2, right next door to our friends at the Teddy Bears Hospital. Along with learning lifesaving CPR skills with the team from Kidzaid Australia, we have plenty of fun activities for the entire family. 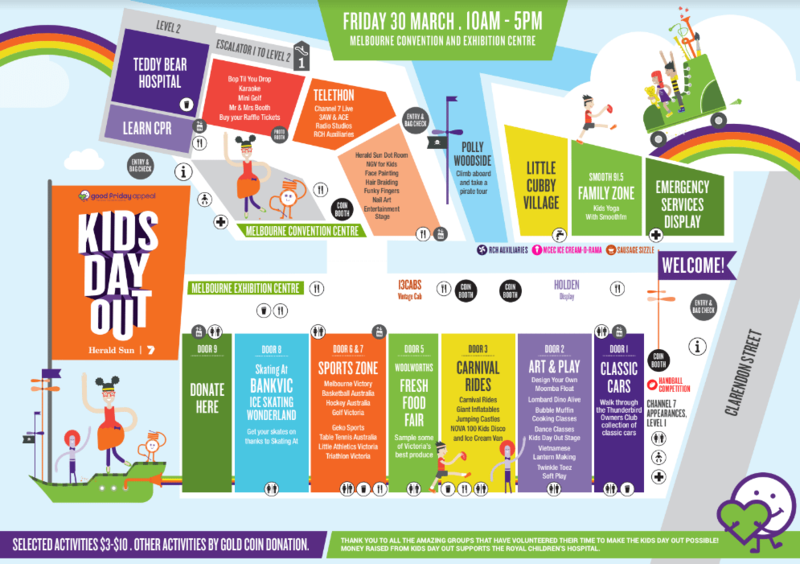 The Good Friday Appeal and City of Melbourne encourage Victorians of all ages to come along to the 2018 Kids Day Out! This annual event is a great excuse to bring the whole family together for a day of amusement, activities and entertainment, all while raising much needed funds for The Royal Children’s Hospital. Come March 30th, the Melbourne Convention and Exhibition Centre will be transformed into a fun filled family festival! Entry is free and all events and activities are participation by donation. “The Kids Day Out, presented by the City of Melbourne, is a great way to get involved in the Good Friday Appeal!” says Good Friday Appeal Director, Anne Randall. “With all the activities, sights, sounds and tastes, it has something for everyone!” With more than 80,000 people expected to attend the event this year, we encourage Victorians to come and participate, donate and enjoy the 2017 Kids Day Out! Empower families, teachers and carer's of children with confidence by educating them in the life saving skill of cardiopulmonary resuscitation (CPR) and Paediatric First Aid. CPR is a skill for life and we are calling on all Victorian families to enter the CPR Training Arena and join in on the family fun activities. Expecting parents, parents, grandparents, aunts, uncles, teachers, nannies, babysitters and anyone else responsible for the care and safety of children. We encourage the entire family to join in, you are never too old or young to learn CPR and have fun at our Easter Wonderland. Simple. You will learn skills that one day may save the life of a loved one. Come with your family and learn CPR for just $5.00, whilst at the same time helping to raise funds for the Royal Childrens Hospital. We will have a fun filled Easter Wonderland for the entire family. Trains – Travel to Southern Cross Station, then catch one of the above trams or bus route 238 (arrives at Convention Centre Place entry), or walk 10 minutes from the station. Parking: Parking is limited so please consider using public transport.